Hello, Welcome you on www.resultfor.in! In this post going to update about the BSEB 12th/Intermediate Admission 2018 through BSEB OFSS CAF Spot. Bihar School Examination Board Patna popularly know Bihar Board. As a part of making digitalization and transparent all the in education information from the academic session 2018, BSEB going to take admission through the BSEB OFSS Intermediate CAF. After Announcement of Bihar Board Class 12th Admission process, the large number of students who passed intermediate 2018 Bihar Board annual examination applied for admission. Some of the students who were unable to take admission or unable to apply for them BSEB again opened the link for applying. BSEB also has given the chance for aspirants who passed Matriculation compartmental examination 2018 for taking admission through the BSEB OFSS CAF Compartmental Pass students. Now Finally any aspirants yet unable to take admission in the Bihar board Class 12th can apply through the BSEB Intermediate spot admission 2018. Students yet due to any reason unable to take admission in any Inter-school ( Inter first year / 11th ) class, Such students can apply for taking admission. Admission through the Spot will be taken by all intermediate school last by 15th October 2018. Admission can be taken only if the respective school have vacant seats. For all new update about it Read Bihar Board inter Spot Admission update. Easy to find information about the Bihar Board Class 12th/ I.a / I.Sc we on this page provided all concerned information about the Bihar board Class 12th/Intermediate 2018. Here before you explain more we would like to update you that you will able to know, What is Bihar board inter spot Admission, How online apply for Bihar Board Intermediate Spot Admission 2018 & Where and in Which School or college and which Stream or Course we can take admission. Before going to explain detail go through the overview information of BSEB OFSS CAF Spot Admission 2018. Spot Admission through this process colleges/ school or institute provided admission update to organization/agency or admission updates and status of seats. In this process university report about their total number of the vacant seat which is available for admission course wise. Before Applying for admission through the BSEB OFSS 2018 CAF Spot Admission read & Notification Importants date for apply and cut off and admission process is 15/09/2018 to 19/09/2018. Through this process students able to get admission after apply Spots Admission Application Forms. The same following of the steps Bihar School Examination Board receive the application from the desired and eligible aspirations for the admission in course of intermediate. After that through Online Facilitation System for Students Board receive an application from students and get data from the school/college / Institute of the total number of students who can take admission & a total number of vacant seats are available to take admissions. Then at the OFSS portal aspirants get chance to know such detail of course / vacant seat and apply for it. In this process, they select the course and colleges and apply for that and take print out of acknowledgment form and submit it respective school/college for further process of admission. The College / School publish the final list for confirmed admission of the students in intermediate and others streamwise. 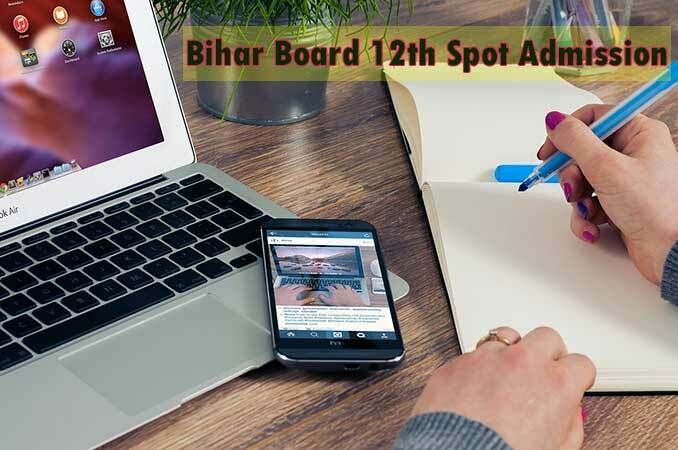 Here going to talk about Bihar State 12th Spot Admission required as per following reason. Students time of admission form apply unable to get information & miss out for apply. For Apply application form they do not have money to apply. Students planned to do some other course but meantime unable to take admission. For further study, it can save one year. Aspirants who have any queries or want to know about the Bihar Board Intermediate /Class 12th Admission Spot then you can ask through the comment.